Groundwater salinity is a widespread problem around the world with adverse consequences on health, soil quality and overall ecosystems. Lalit has found a simple and effective way to create freshwater pockets for potable use within saline aquifers. He has worked in villages in India to develop an innovative technique that creates a pocket of freshwater within a saline aquifer. By digging the recharge well deeper and extending height, the well creates hydrostatic pressure and pierces the saline water even in very shallow aquifers — creating a pocket of freshwater. The water is then extracted via a hand pump and run through a Biosand filter to make it safe for use. The solution to address water scarcity in saline groundwater/seawater intrusion affected areas is called : "Creating freshwater pocket within saline aquifer for potable use"
With the rapidly growing demands of groundwater, its exploitation is also accelerating which causes depletion of groundwater. Depletion of groundwater changes the flow (both direction and velocity) of the groundwater, which may cause inflow of polluted water into the freshwater aquifer from surrounding areas. In coastal areas this results in sea water intrusion into the freshwater aquifer. The major consequences are potable water scarcity and rise in the levels and spread of groundwater salinity. To address the issue of potable water scarcity caused by salinity, an innovative model of roof water harvesting (RWH) system is conceived and tested in groundwater salinity affected areas in India. 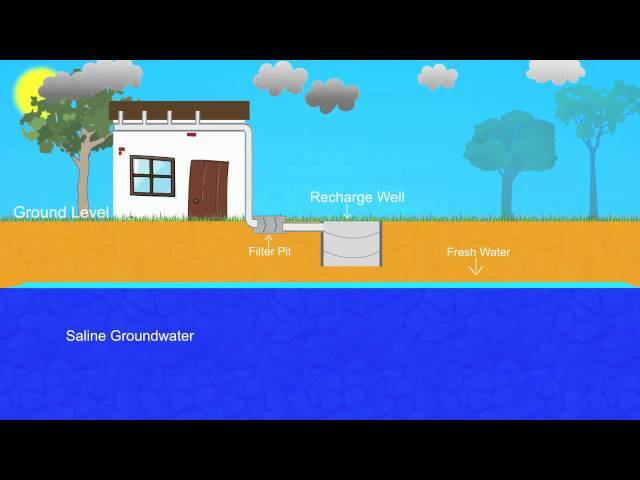 In conventional method, recharging is done at a depth under the ground, leaving safe distance above the groundwater table, so that the recharged water gets infiltrated into the ground in order to avoid chances of contamination of groundwater. But this recharged fresh water does not remain in a consolidated mass. This recharged fresh water spreads out over the existing saline groundwater in aquifer. Eventually, in order to maintain hydraulic equilibrium, the recharged freshwater spreads over large area in aquifer and forms a thin layer over the existing saline groundwater. Exploiting this thin layer of harvested freshwater sitting over saline groundwater separately is practically very difficult as it gets mixed up with the existing underlain saline groundwater in the process. In order to exploit the harvested rain water separately, it should form a sizeable pool or pocket instead of thin layer spread over larger area. To achieve this, an innovation in the traditional recharging was developed. In the new model, recharge wells are sunk to a depth, lower than groundwater table. With it, desired freshwater pocket could be formed by pushing away and replacing the existing saline groundwater. The harvested fresh water from this pocket can now be extracted for potable use, as it is pushed by surrounding saline groundwater pressure. Most often in saline groundwater/coastal areas groundwater table is shallow. This shallow depth is another challenge as it limits the rate of recharging. The shallow groundwater depth creates low hydrostatic pressure (overburden pressure) for recharging resulting in low rate of recharging. This limits the quantity of recharge. To overcome this challenge, recharge well is raised to roof height, leaving a margin to accommodate a pre-filter that removes suspended and floating materials coming with rain water from the roof. This way, the hydro-static pressure for recharging is increased with an additional hydrostatic head. Groundwater, across the globe is marked by fast depletion of aquifers. The phenomenon increases salinity levels and spread in both coastal and inland aquifers. Particularly in coastal areas, the threat of seawater intrusion is increasing (advancing and encroaching over freshwater aquifers) due to rising sea levels. Most of the countries in the world are struggling for ways to address potable water scarcity due to inland salinity or coastal seawater intrusion.